Mafia-free tourism, a new frontier for the ethical tourist, supports those who rebel against the Mafia dominion. We offer you a land of extraordinary cultural and artistic heritage. An experience which balances beauty with social duty. This is an opportunity to understand, first hand, the most important moments, people and places of the Anti-Mafia movement. We want to show our visitors the real face of Sicily, above and beyond stereotypes and tourist traps. We want to restore dignity to our country and raise the profile of the people who are fighting for change. We want our guests to be captivated by this experience so that they may have the same enthusiasm as us. The businesses which we use for our tours do not pay pizzo (this is the Italian name for protection money, a sort of "extorted tax" imposed by the Mob). They are owners of hotels, B&Bs, restaurants, farms and transport agencies who have made the brave decision to rebel against the Mafia. Some of them work in premises confiscated from bosses of Cosa Nostra. Whoever travels with us chooses accommodation facilities certified by Addiopizzo and travels 100% pizzo-free. Take a stand and aid the development of circulating a clean economy. Take a stand and support the volunteers working on the front line of this social conflict. Take a stand and help us stop the Mafia receiving a single cent of your money. A part of the revenue of Addiopizzo Travel is donated to local NGO which plays an active role in our tours: Comitato Addiopizzo, Casa Memoria Peppino e Felicia Impastato a Cinisi, Libera, Centro Sociale San Francesco Saverio, Centro Siciliano di Documentazione "Giuseppe Impastato". In particular, the funds we donate to Addiopizzo is used for publicize the communication campaing against the Mafia, strenghten the mafia-free shops and business network and contribute to the social, cultural and recreational activities with children and teenagers in the poorest areas of Palermo. Our tour operator emerged from Addiopizzo as an extension of the ethical consumer strategy against the pizzo it specifically targets the tourism sector. 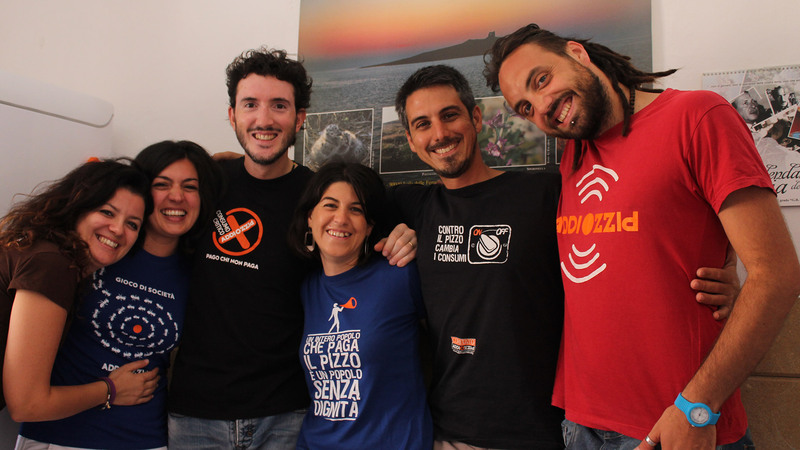 This grassroots Anti-Mafia movement was founded in 2004 by a group of young people under one slogan: an entire people which pays pizzo is a people without dignity. The strategy used by Addiopizzo in its work is wholly innovative: ethical consumerism against the pizzo. People's selective purchases support businesses which do not give in to the extortionate demands of the Mafia and openly side against them. Addiopizzo urges society to commit to change and encourages a collective cultural revolution against the Mafia. Our "mafia-free tourism" project originated from an idea had by Dario Riccobono, Francesca Vannini Parenti and Edoardo Zaffuto, the co-founders of the " Addiopizzo Commettee”. All are currently still involved full-time in the association. Our challenge is to combine our voluntary activities in Addiopizzo Commette with our new job in Addiopizzo Travel. With time, the Addiopizzo Travel team has grown, welcoming Chiara Utro and Enza Sorci who are tasked with managing the study trips, bike tours and oversee the booking process. Finally Daniela Ballarò joined the team with the important role of keeping the accounts in order. The trip leaders play an essential role for Addiopizzo Travel, accompanying the travellers during the tour and offering a direct connection to Sicily and the antimafia movement. We are eternally grateful to the interns, volunteers, students and scholars who, for either longer or shorter periods of time, from close and from afar, have worked with us and continue to give us invaluable help. A massive thank you to; Kirstin Burow, Miriam Mascellaro, Pico Di Trapani, Christine Harlacker, Nora Leszak, Simon May, Daran Jones, Jakob Littmann, Sebastian Wittkopf, Sonja Siersch, Monica Cinà, Daniela Battaglia, Olly Rhode, Libby Key, Paola Cavallari, Stefania Fontana, Felicia Mazzara, Julie Loire, Fabian Ryom, Mads Larse, Ella Dorfman. Goals & Accomplishments Goals achieved and new horizons: here the history and the work plan of Addiopizzo Travel. 2009 Birth Addiopizzo Travel emerges as a branch of the Anti-mafia ognanization Addiopizzo: an extension of the ethical consumer strategy against the pizzo it specifically targets the tourism sector. 2010 APQ Project The Regional Touristic Department of the Sicilian Region chooses Addiopizzo Travel as the recipient of a grant directed to the planning of touristic itineraries capable of highlighting the Sicilian territory in its several components and resources, and to the internationalization of the touristic product “Sicily”. It is the project A.P.Q. “Systematic Actions for the Tourism” between the Department for the Economic Development and Cohesion of the Ministry for the Economic Development and the Touristic Department of the Sicilian Region with the initiative “3 NEW – Sicily pizzo-free”, for the planning of two itineraries on cinema and literature in Sicily and cycle-tourism. 2011 Paesaggi d'Autore Addiopizzo Travel presents two literary tours: "The Sea by the City" and "Palermo Theatre Noir". They are the outcomes of the interregional project “Author Landscapes”, aimed at the organization of two activities of territorial entertainment. 2012 To Do! Contest Addiopizzo Travel wins the TO DO! CONTEST in 2011, an International award dedicated to responsible tourism projects. 2013 Pionieri Addiopizzo has been one of 10th realities identifiable as social enterprises, associations, or Italian startup to be recognized as Pionieri by the association RENA. The “pioneer projects of social innovation and responsibility” had been inserted in an e-book presented to the Italian Parliament in Rome in April 2014. 2016 AITR Addiopizzo Travel's office in Isola delle Femmine becomes regional headquarter of AITR, Associazione Italiana Turismo Responsabile – Italian Association for Responsible Tourism. 2016 Ashoka Addiopizzo Travel joins Ashoka, the largest network of social entrepreneurs worldwide. 2016 Social cooperative Addiopizzo Travel becomes a Social cooperative. According to the Italian Law, "social cooperatives pursue collective benefit, human promotion and social integration of the community. Hanno viaggiato con noi Dal 2009 a oggi, abbiamo organizzato tour per migliaia di persone: viaggiatori individuali e famiglie, scuole e univ ersità, gruppi scout e parrocchiali che hanno scelto di viaggiare pizzo-free. Ashoka, Coventry University, Friedrich-Alexander Universität, James Madison University, Ludwig Maximilians Universität München, Mediterranean Center for Arts and Sciences, Sprachenschule im Kreuzviertel, Studiosus, Università del Salento, Università di Bologna, Wien Universität, Zeppelin Girolibero, . Laureato in Scienze della Comunicazione, completa i suoi studi facendo un master in Economia e Gestione del Turismo presso il Ciset di Venezia. Dal 2015 è un Ashoka Fellow. Per Addiopizzo Travel si occupa di comunicazione, marketing, public relations e… gira le scuole di mezza Italia. Classe: 1979 Canzone: Rock'n'roll dei Led Zeppelin Film: Django Unchained di Quentin Tarantino Libro: Cosa Nostra: Storia della mafia siciliana di John Dickie Piatto: Spaghetti coi ricci di mare (ma anche u pani c'a meusa) Hobby: il Palermo Calcio e il Fantacalcio Ipse dixit: «Legalità e sviluppo economico possono camminare a braccetto» lo ripete come un mantra Sogni: la vittoria su Cosa nostra, lo scudetto a Palermo e introdurre i Litfiba sul palco della festa pizzo-free A Dario piace: mangiar pesce, andare allo stadio, farsi rincorrere dalla sua bimba A Dario non piace: la peperonata, Zamparini e fare shopping. Socio fondatore. Laureata in Scienze della Comunicazione all'Università di Palermo, volontaria del Comitato Addiopizzo per il quale segue e coordina il progetto scuole. Dopo alcune esperienze lavorative in campi diversi, decide di seguire i suoi due soci in questa bella avventura. Per Addiopizzo Travel si occupa di marketing turistico e di amministrazione. Socio fondatore. Socio fondatore. Laureato in Lettere Moderne, ha esperienza come webmaster e come accompagnatore cicloturistico. Con Addiopizzo Travel si occupa di progettazione turistica, web e stampa estera. Classe: 1975 Canzone: She Caught the Katy dei Blues Brothers Film: Monty Python Libro: Il nome della rosa di Umberto Eco Piatto: ravioli al pistacchio Hobby: andare in bici, leggere Ipse dixit: «conosco una scorciatoia» Sogni: il giro del mondo in camper A Edoardo piace: fare i picnic in montagna con i bimbi A Edoardo non piace: stare fermo, lo scirocco, cambiare pannolini. Laureata in Storia dell'Arte e dottoranda all'Università Sorbonne-Paris IV di Parigi, guida turistica regionale per la Sicilia. Volontaria del Comitato Addiopizzo, inizia a collaborare al progetto di Addiopizzo Travel dal 2010. Oggi si occupa del mercato francese, dei prodotti e del commerciale. Laureata in Lettere Classiche, completa i suoi studi facendo un master in Management dei Beni Culturali a Firenze. Da alcuni lavora nell'ambito del turismo responsabile. Inizia a collaborare con Addiopizzo Travel nell'agosto del 2013 e oggi si occupa di amministrazione, dei prodotti e del commerciale. Socio. Laureata in Ingegneria Edile all'Università di Palermo. Classe: 1983 Canzone: Tutta la discografia di Laura Pausini! Film: Indipendence Day (l'originale, quello del 1996) Libro: Il cacciatore di aquiloni di Khaled Hosseini Piatto: la pasta al forno di mamma e la carne con la "grattina" (chiedere cos'è e provare per credere!) Hobby: lamentarsi! Di ogni cosa, continuamente :) Sogni: diventare una grande tennista, batterista e cantante A Daniela piace: giocare a basket, mangiare gelati, andare al mare sugli scogli, soprattutto a Sferracavallo A Daniela non piace: quando in ufficio manca il caffè!